Transcription factor HY5 is a nuclear protein that belongs to the bZIP family, which promotes photomorphogenesis in light. HY5 acts downstream of the light receptor network and directly affects transcription of light-induced genes. HY5 is specifically involved in the blue light specific pathway, suggesting that it participates in transmission of cryptochromes (CRY1 and CRY2) signals to downstream responses. In darkness, its degradation prevents the activation of light-induced genes. Rabbit polyclonal antibodies were produced by immunizing animals with a GST-fusion protein containing the N-terminal region of arabidopsis thaliana HY5 (At5g11260). Antibodies were purified by affinity purification using immunogen. Fig 1. 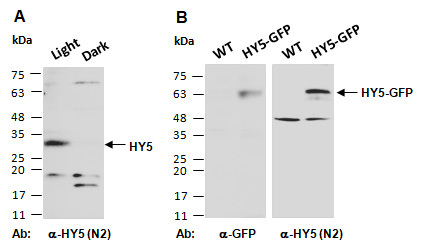 A) Western blot analysis of total protein extracts from wild type Arabidopsis grown under light (Light) or grown in dark for 4 days (Dark), using anti-HY5 (N2) (R1245-2) at RT for 2 hr. The observed M.W. for HY5 is 30 kD [Osterlund M. et al., (2000) Nature 405:462]. B) Western blot analysis of total protein extracts from wild type Arabidopsis (WT) or transgenic Arabidopsis plants expressing HY5-GFP fusion protein, using anti-GFP (M0802-3a) or anti-HY5 (N2) (R1245-2) at RT for 2 hr as indicated.